Aspects of the lives of infants from the past can only occasionally be directly seen in the archaeological record. Human osteologists from Museum of London Archaeology are currently examining skeletons excavated from the long disused burial ground of the Catholic mission of St Mary and St Michael in east London. MOL Archaeology had been called in to carry out archaeological excavations prior to the redevelopment of the site. These excavations were undertaken on behalf of the client and in consultation with English Heritage. Once scientific analysis is complete, the remains will be reburied by the Church. The burial ground was in use between 1843 and 1854 and excavations in advance of building work revealed more than 700 individuals. Approximately 62% of those buried were children, the vast majority of whom died between one and five years of age. The completeness of the preservation of the skeletal remains from this site has enabled us to see changes to the bones resulting from rickets. Rickets is a metabolic disease caused by a lack of vitamin D within the body. Vitamin D is important in developing strong and healthy bones. Most of the body’s requirements can be obtained through exposure to sunlight, but some is acquired through a healthy diet. If a child does not have enough vitamin D, it can result in softened and weakened bones which can no longer support weight and become bowed. 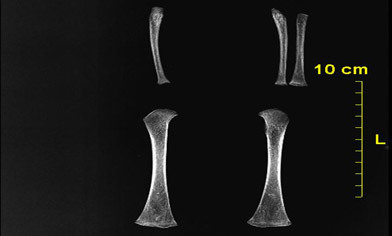 Recent work by MOL Archaeology in collaboration with the Department of Radiography at City University, London has investigated the use of computed radiography on large skeletal assemblages. We know that rickets thrived in the poorly sanitised, overcrowded, smog-filled air of 19th century London. Swaddling, the practice of wrapping infants in tightly fitting blankets in order to restrict movement, and malnourished mothers feeding their children with deficient milk, may also have played a role. A spiralling population living in poor conditions, often with limited access to clean water or waste disposal, resulted in high rates of infectious disease and may have led to sick children being kept indoors away from the vital exposure to sunlight. 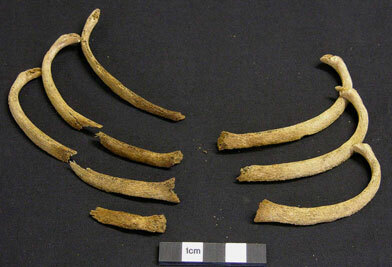 Seventy-eight (17.8%) of the 437 child skeletons analysed showed signs of active rickets. Almost all (94%) were aged under five years of age at death. The changes seen in the children from St Mary and St Michael include areas of pitting of the bones of the skull, bowed and deformed arms and legs with widened and thickened ends, and flared rib ends. There is no evidence of the affects of rickets amongst the adults, suggesting that those infants affected did not survive. Improvements in living conditions and diet during the 20th century led to the decline of rickets in this country. However, recent studies have reported a resurgence amongst children, blamed on increasing levels of pollution, reduced exposure to sunlight and a lower level of awareness of the disease and the importance of maintaining vitamin D levels, especially for women during pregnancy and in growing infants. The knowledge gained from the study of those afflicted in the past can help us to better understand the causes of rickets today and promote awareness of its recurrence in the modern world.